Plateau of Na’Bpah, or simply, SP-Plateau is a short 2-map campaign for UT by Diamond. The first map is merely an intro but since it is not a flyby map but actually playable, so we categorise it as a “small campaign” rather than a single map. All the action however takes place on the 2nd map. SP-Plateau lacks a proper story or a proper ending, but otherwise has some unique solutions that makes you wonder if it is a complete beginner’s map or not. 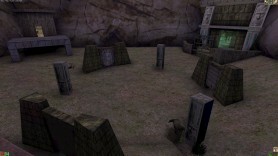 The first map features some custom classes which make it possible to have usable computer screens which are not really used to their potential but impressive anyway. In both maps it is apparent that the author did give some thought for the design but a real good execution was beyond his abilities at the time. Some areas still shine such as a corridor with a nice ornamental floor or an area that actually manages to use some textures from Crypt.utx with a good taste. 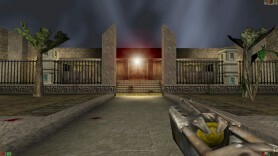 There are also a number of annoyances such as too big and bright coronas, places where the player can get stuck on geometry and the general lack of interesting fights. On the UnrealSP forums Diamond announced he would continue the story and some very promising screenshots were shown, however the release date is still unknown after several years. We do hope one day it will be completed! This is the auto-generated forum topic dedicated to SP-Plateau.